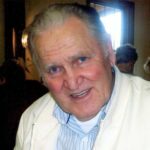 Joseph E. Mullen, 82, passed away January 10, 2019 at the Heartford House in Owensboro, Kentucky. Born September 7, 1936, in Spencer County, Indiana, he was the son of Roy and Nellie (VanWinkle) Mullen. He married Marjorie (Graham) Mullen on October 20, 1956. Joseph was an entrepreneur, a member of Masonic Lodge 656 and the Carpenters Union. Joseph was a man of many talents. Right out of high school he ran an ice truck, cut trees and logged with his dad, Roy. Other areas included working at the State Hospital in Evansville, driving a school bus, buying and building homes to remodel and rent/sell, being a Precinct Committeeman and a Mason, being involved in the coal business, working at Tell City Chair Company at night, and owning the Sportman Delight, Log Plant, and Metal Recycling. He loved all animals including the thoroughbred horses and turkeys that he raised along with cows and pigs. He enjoyed camping, fishing, hunting, and especially all of his family and friends. Surviving is the love of his life, his wife, Marjorie; children, Donna Green-Lynam (George) of Chrisney and Mike Mullen (Stacy) of Newtonville; 7 grandchildren, Karen Mercer, Ginger Hall, Mark Mullen, II, Bobby Joe Green, Billy Allen Green, Sami Jo Keller, and Morgan Burton; and 20 great-grandchildren; 3 brothers Louis Mullen, Tom (Barb) Mullen and Randy (Max) Mullen; 3 sisters, Bonnie (Cecil) Weedman, Sue (Rick) Snyder, and Nancy (Lynal) Rust. Preceding him in death are his parents; children, JoAnn Mullen, Darrell Mullen and Mark Mullen; siblings, Don, Jerry, and Clyde Mullen; and grandchild, Alex Mullen. Funeral services will be held at 11 am Monday, January 14 at Oak Ridge Apostolic Pentecostal Church with burial in Troy City Cemetery. Visitation will be from Noon to 5 pm Sunday, January 13 at Zoercher-Gillick Funeral Home and from 9 - 11 am Monday at the Church.